Matteo Paolieri was born in Pistoia, Italy, in 1996. He is currently studying at the faculty of chemistry at the University of Florence. He is the author of “Ferdinand Münz: EDTA and 40 years of inventions,” Bulletin for the History of Chemistry 42(2), 2017, 133-140, upon which this article is based. The Austrian chemist Ferdinand Münz (1888-1969) invented and synthetized EDTA (ethylenediaminetetraacetic acid) in 1935 and was also the author of many patents in the textile field, whose trademarks still exist today. So, what exactly is EDTA? Long story short: EDTA is one of the most important compounds in analytical chemistry and it is used in everyday life in products such as shampoos, bactericides, mercury poisoning treatments, food preservatives, and tissues dyeing. Yet Dr. Münz has been virtually unknown to the history of science. But why? Because of persecution for his Jewish origins. Ferdinand Münz was born in Krakow on June 23, 1888. His parents were Michael and Bertha Münz. The city was then part of the Kingdom of Galicia and Lodomiria, one of the most populated provinces of the Austro-Hungarian Empire. We have little information about his childhood and his family. He had three brothers: Stefan, Ernest, Amelie; the latter died in a concentration camp. When Ferdinand was 10 years old the Münz family moved to Vienna. After the fall of the Empire in 1919 he opted for Austrian citizenship. He attended K.K. Staatsrealschule of the 5th district of Vienna. In 1906 he began to study chemistry at today's Technical University of Vienna, still one of the most prestigious universities in the world. In the years following 1934-35 he apparently tried to emigrate to New York, but from November 25 to December 1, 1938 he was interned in the Buchenwald concentration camp. Some documents listed him as a "Jew." In marriage documents, specifically in the period around the 1930s when he lived in Frankfurt, he was listed as "Aryan." It is probably thanks to his wife that he managed not to fall prey to the Nazi government and therefore not to perish in a concentration camp. Or maybe he survived because – like the Italian Primo Levi (1919-1987) – he was a chemist. The Nazis had a great need for chemists. The years 1930-1943 are "the golden period" of this inventor. In this time frame he learned how to synthesize numerous commercial compounds whose trademarks still exists today. Suffice it to mention EDTA, whose patent was filed in Germany by him in 1935 and patented anonymously in 1942 because of his Jewish origin and the Nazi persecution. 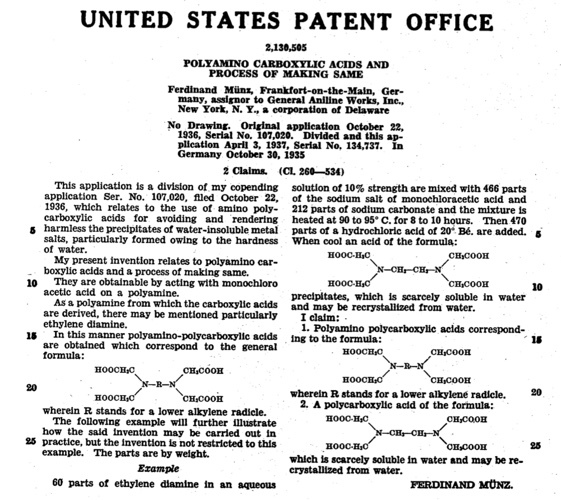 In 1936 he patented the same discovery in the United States, in an attempt to give greater visibility to his discovery, this time with his name on it (patent US 2130505). He was interned in Theresiendstadt concentration camp (in today’s Czech Republic), which was used as a prison camp and as a place of transit to the eastern death camps. He was released on April 9, 1945, just weeks before the camp’s prisoners were liberated by the Red Army on May 8. In 1949 he co-worked with the Nobel laureate Kurt Alder (1902-1958), when they published together a paper on diene synthesis and additions. Kurt needed him because EDTA is used in the polymerization process to make a kind of rubber (SBR). On January 1, 1956 Münz retired to private life and died on August 16, 1969 in the town of Glashütten, aged 81. He was buried in the hauptfriedhof (main cemetery) in Frankfurt. Dr. Münz was working during the darkest years of the 20th century and that contributed enormously to his eclipse as a man of science. Unfortunately, in Germany during those years, a Jew could not carry out research freely and many of his publications and patents appeared in literature without his name. Now at last he can get the credit he deserves.